This is Oakland Place's most effervescent rendition of the Colonial Revival style. The balanced façade is fronted by a full-width porch supported by fluted Tuscan columns, while above on the second story, oriels flank a pair of oval windows. The high hip roof is pierced by numerous dormers topped with broken swan's neck pediments and finials, and the roofline was originally crowned with a balustrade. The north façade is especially interesting: delicate oriel windows of curved leaded glass flank the massive chimney. The projecting second floor shelters them and enfolds the chimney. In a departure from the usual clapboards, the entire exterior is clad in alternating wide and narrow bands of shingles. The paneled, double vestibule is an unusual feature; to the right of it, there is a small room that can serve as a sitting room or reception room. The paneled stair hall is straight ahead from the vestibule. The staircase rises past a large leaded glass Palladian window to the open second floor hall. The delicate colonial balustrade bears a natural finish; the entire hall originally bore the same finish. The door and window casings have ears, or slight projections of the lintels, and the bottoms of the door casings have returns, which are very unusual. There is a large library opposite the stairs. The library has built-in bookshelves, leaded glass windows, and a beautiful Gothic fireplace detailed with slender columns, quatrefoils, pendants, and rosettes. There is a small office next to the library; the office has a built-in desk. This was a good location for the butler to manage the house. A small breakfast room overlooks the yard. The home was built for William H. Hotchkiss and his wife, Katherine Bush. It was designed in late 1897 by the firm of Lansing & Beierl and work was completed the following year. 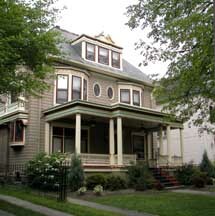 Katherine's family lived in a mansion at the northwest corner of Delaware Avenue and Summer Street [#762] and they had owned the land on which this new home was built since 1860, long before Oakland Place was established. Hotchkiss was a lawyer with Hotchkiss & Bush and he later served as state superintendent of insurance. Frank St. John Sidway (1869-1938) purchased the house from them and it remained in his family for more than 70 years. Sidway was a descendent of three of the most prominent and wealthy families of nineteenth-century Buffalo: St. John, Spaulding, and Sidway. The St. John family's history in Buffalo included the fact that the family homestead was the only one spared by the British when they burned Buffalo in 1813. Frank's grandfather was United States Representative Elbridge Gerry Spaulding, who introduced legislation to create the first Federal paper money during the Civil War. The pieces of currency were known as greenbacks; the tradition continues today as American dollars have been printed with green backs ever since. Frank eventually assumed the role of the family's patriarch. As a symbol of his prominence in the family, portraits of his grandparents, Jonathan and Parnell Sidway, hung on either side of the dining room window. In addition, a famous painting by Thomas LeClear, Interior with Portraits, was hung in a place of prominence above the fireplace in the library. The 1865 painting, which features two of Frank's relatives, now hangs in the Smithsonian. Frank St. John Sidway was a prominent lawyer who had practiced in the city since graduating from the Buffalo Law School in 1894. He took a leave during law school to fight in the Spanish-American War. In addition to practicing law, Frank managed estate investments and the interests of the Sidway family. The family's holdings included the Sidway Building at Main and Goodell Streets. Frank's brother lived across the street at 38, and his nephew Elbridge later lived at 22. When Frank St. John Sidway died in 1938, ownership of the house passed to his wife, Amelia Roberts Sidway, who lived in the house for many years. A descendant remembered that on the eve of World War II, servants still served all meals in the dining room. To summon her household staff to serve, Mrs. Sidway simply had to step on a button in the floor beneath the table. Just before her death in 1972, ownership of the house passed to her daughter Edith, who lived here with her husband, Steven I. Stevens, until 1975.